Everyone knows that when you go out to eat, the cost of your drinks is much higher than you pay at home, whether it is coffee, chocolate milk, or vodka. If you have ever worked as a server, then you realize that one way to increase the size of the party’s check is to add drinks. That is true at diners, cozy coffee shops, and at high-end restaurants. And if you are just starting out as a waiter or waitress, then you need to know the highest profit margin in a restaurant is on the beverages. There are ways to add drinks to every check, even if you just offer coffee or tea at the end of every meal. One particular way to increase sales and to improve dining experiences for patrons is to concentrate on wine sales. As a server, you may not eat every dish on the menu. You may have your own dietary restrictions. This should not prevent you from selling and serving any meal. Likewise, you may not drink wine very often or even like it, but you can learn about it so that you can sell it with confidence. Servers need to know the basics of wine so that they can at least have a conversation with the table they are serving. No one needs to be an expert. Experience is a great teacher, and knowledge will come with time. The wine list is organized in every restaurant. Look at it. Know how it is classified: Old World, New World? Regions? Varietals? If there is a short list for wines by the glass, then learn that first. Some wine lists boast hundreds of wines. No one expects you to be able to describe every wine. Ask your boss for helpful hints. Listen to your co-workers. Some servers have worked at Italian restaurants or Sports Themed Bars, which have their own distinct ways of presenting and serving wine. The experienced staff can help you to serve! You should know which are reds, which are whites, and which are sparkling. You can study wine for years and learn all the details. For serving purposes, you need the basics. Every restaurant should offer their staff continuous, regular wine training. With staff turnover and changes in the restaurant industry, this training is essential to providing stellar service. Many distributors will provide training on premises for free. If you are responsible for training staff, make sure they know the grape varietals and regions; how to properly pronounce the wines on the menu; how to open and pour a bottle of wine; and how to pair wine so they can suggest appropriate wine for your customers. Learn which wines are the most popular at your restaurant: there are reasons why people order them: is it the great price? Is it because Cabernet Sauvignon is a best seller? Is there another similar wine you can offer? Learn about one red wine and one white wine. Be confident in your knowledge of them and even if you only sell those two wines for six months, at least you will become comfortable in your selling ability. Most diners already know what they like, and will order the particular white wine they always order or their favorite red. If you tell them about why you like your favorite wines, they may be willing to try your suggestions. For example, “This Pinot Noir from Oregon is very mellow and elegant. The red fruit in it is understated. It is one of the best-selling wines on our menu. I have had it with a ribeye and with salmon.” “You are having the crab tonight. Have you ever tried Albarino wine from Spain? It is delicious, and less tart than Pinot Grigio or Sauvignon Blanc. It really complements the flavors in the food.” Your enthusiasm will go a long way toward convincing people to try your recommendations. Your customers may know nothing about wine, or a lot and still listen to your recommendation. Always know beforehand if any wines are unavailable. You may be able to get your table to order a similar wine by the bottle. Selling wine by the bottle is generally an easier way to connect with the party you are serving and also more profitable for the restaurant. For example, selecting and choosing a wine gives you the opportunity to talk with the customer and make menu or appetizer suggestions. This interaction translates into time that is more meaningful with guests, increasing both food and beverage sales. This also helps you to serve other tables and guests more efficiently, since you are not constantly running back to the bar for more drinks or glassware. When a bottle is empty, instead of asking if the table wants another bottle try, “Would you like another bottle of the same wine, or something different?” Just remember that if they do order something different to bring new wine glasses to the table. After dinner, you may offer alcohol and coffee drinks, or more wine. Chocolate desserts pair very nicely with red wine, and there are dessert wines and port that are also great options. Assume everyone wants wine. Instead of asking if they’d like wine, ask whether they would prefer red or white. Make wine the priority. Once the order is taken, get the wine to the table as fast as possible. When a table orders two glasses, always offer the full bottle. When emptying a bottle, don’t ask if they’d like another, instead ask if they’d like the same or a different variety. Before bringing the bottle to the table, servers should be sure to have a corkscrew or wine key; a foil cutter, if not using a wine key; and a napkin or glass polisher. The waiter should begin by showing the wine to the person who ordered it, no matter who is paying the bill. The waiter should display the label with their hands and announce the vineyard, grape, location, and vintage. Make sure you do not open the bottle until you get confirmation that the wine is exactly what the guest wants. It’s also essential that everyone at the table that is having wine has the proper wine glass before you open the bottle. If there are wine glasses on the table, it is also important to remove wine glasses from anyone that has told you they are not having wine. If you are unsure, ASK! There are horror stories about restaurants pouring a bottle of $200 wine when the person ordering had asked for something much less expensive. If someone orders a bottle, always present the bottle for them to look at before you open the bottle. That way the person has an opportunity to speak up if it’s not what they want. If you make a mistake, the restaurant loses money, and you might too. If someone at the table is not having wine, you can offer a mixed drink, sparkling water or at the very least have a conversation with them about what they like to drink. Learn how to open a bottle of wine properly. It is part of the dining experience for your customer. If you are not comfortable doing this, have someone do it for you. Whether it’s a Champagne cork, a regular cork, a screwcap, or any other closure, you should open the bottle with a minimum of noise and fuss. Your aim should be to get the cork off without letting the wine escape, the bubbles escape, or bits of cork fall into the bottle. Practice this at home so you’re able to open bottles smoothly. It is not difficult. Just new to you. To open a bottle of wine: Cut the foil around half an inch from the lip of the bottle using a foil cutter or the small knife in a waiter’s style wine key. This ensures the wine doesn’t touch the foil and can help prevent dripping. Place the corkscrew directly into the center of the cork and unscrew it straight into the air. Once the cork is three-quarters out of the bottle, finish it quietly by hand to avoid a loud popping noise. One way to do this is to gently wiggle the cork back and forth until it’s all the way out of the bottle. After the cork is removed, wipe it and the top of the bottle off with a napkin. This helps remove cork debris and dust from storage. When opening and serving a white wine, you should place part of a napkin between the bottle and your hands to keep the warmth of your body from affecting its temperature. Decanting expensive bottles of wine is also another dining experience that needs to be done properly. Decanting is the process of pouring a bottle of wine into a decorative decanter before serving in order to separate any sediment that has formed. It also helps aerate the wine, which can give it a boost in flavor and aroma. This process is typically saved for red wines that have been stored for more than five years, but some guests might request that their wine be decanted. As a server, remember to pour slowly and continuously until all that remains in the bottle is the unwanted sediment, and then discard the remaining residue. Once you bring the wine to the person who ordered it and confirmed that you have the correct bottle you can open it. At this point, it’s customary to present the cork to the guest who ordered the bottle for them to sniff or examine, allowing them to verify the condition of the wine. Some guests feel the cork to make sure it’s not dried out, while others will smell the cork to take in its distinct aroma or examine the color of the cork to ensure that the bottle has been stored properly. If they do not want to see the cork, you should place the cork to the right of the wine glass of the guest that ordered the wine. Or to the right of the bottle when you place it on the table. When pouring wine, you should wrap the bottle in a clean linen napkin to protect it from the warmth of your hands. I try to use napkins that match the wine color. This isn’t essential for serving red wines that aren’t chilled, but your guests will probably appreciate the extra effort. Wine can be flawed for a number of reasons. It could have been stored in hot temperatures and turned into vinegar. You need to give the person a chance to taste the wine and confirm that the wine is drinkable. Pour out a small portion of around a half inch to whoever ordered the wine and allow them to sample it. Make sure they approve of the wine. Then move clockwise around the table filling each glass. Pour fairly slowly so if someone doesn’t want wine they can speak up before you put wine into their glass. Also, don’t fill the glass to the rim. People need to be able to swirl their wine. Most glasses should be half-filled at most. You should end with the person that ordered the wine. Pour the wine from the right side of the guest. You will only get four to five pours from a 750 ml bottle, so pour accordingly. Finish each pour with a twisting motion and wipe the lip of the bottle to avoid dripping. Place the bottle to the right of the host with the label facing outwards and ask permission to remove the cork from the table. If the guests are enjoying white wine, ask them if they would like the wine left on the table. If they would, provide them with a wine bucket or cooler. Since white wine is usually served chilled, your guests might also opt to have it returned to the refrigerator until they are ready for a second glass. If tables are cramped or the dining room is busy this could happen. Just make sure the bottle is marked for your party. Sparkling: Pour in a trickle to avoid over-stimulating the bubbles. 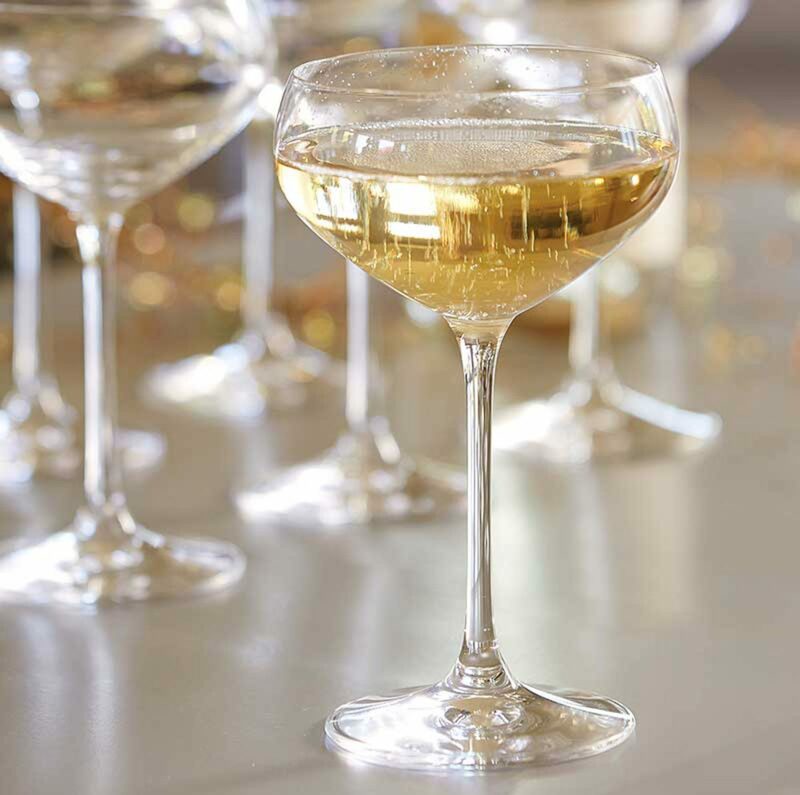 Pour a small amount in the flute, let the bubbles settle, and then pour until the glass is three-quarters full. Red or White: Slowly pour the standard wine pour (4 or 5 oz.) into the center of the glass until it’s around one-third to one-half full. Some restaurants use different glasses for each type of wine. Make sure you know the proper glass and the proper amount to pour. Regardless of the type of wine, servers should always hold the bottle with both hands and leave the wine glasses on the table as they pour. Additionally, make sure there’s 6″ to 10″ between the bottom of the wine glass to the lip of the bottle as you pour, as this allows the wine to aerate as it falls into the glass. Wines you can expect to be asked about, or to see on a wine list: Bordeaux, Burgundy, Cabernet, Cava, Champagne, Chardonnay, Chianti, Garnacha, Grenache, Malbec, Merlot, Meritage, Moscato, Pinot Noir, Prosecco, Riesling, Rioja, Rose, Red Wine Blends, Sauvignon Blanc, Semillon, Shiraz, Syrah, and Zinfandel. If you are curious, go to a wine tasting or ask about these wines when you go out to eat yourself. You are serving a person a delicious drink, it is not rocket science. You will get better and better every time you do it. And this will help you immensely when you go out to eat yourself. You will learn which wines you love and how to have a great dining experience at home and at a restaurant. It will be a great social skill for you wherever you live and whatever work you do. At the very least, it is a great conversation starter. And a lot of great stories have started with a glass of wine. Very thorough, well stated, and quite informative! Previous PostPrevious Live Long and Prosper.